With the annoucement of the iPhone 3GS, many of us wonder what changes the new iPhone brings us. Apple released the new iPhone mainly to address one issue: performance, hence the “S” connotation for Speed. 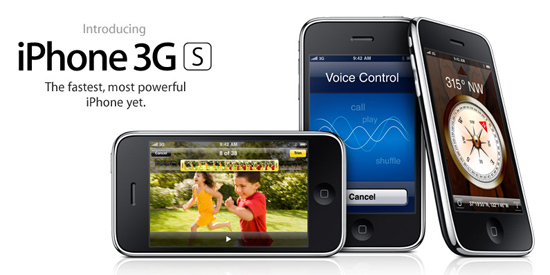 Apple claims that the new iPhone 3GS would be up to 2X faster than the iPhone3G. Physically, you can’t tell the difference between the iPhone3G and iPhone3GS, other than the badge marked on the back of the phone. In order to supply the 2X faster performance as advertised, Apple had revised the hardware with higer performance chips. First we look at the CPU update. The original iPhone and iPhone 3G use a system on a chip (SoC) from Samsung. 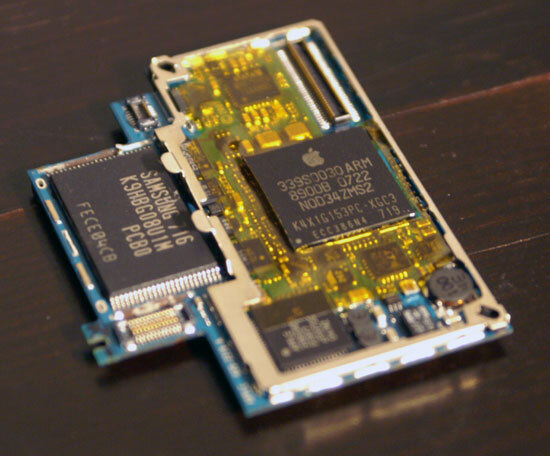 The SoC is a custom part and actually has Apple’s logo on the chip. The SoC houses the CPU, GPU and memory for the iPhone. The CPU is based on the ARM11 core, and runs at 412MHz to save power, although the core is capable of running at 667MHz. The ARM11 CPU is a single-issue in-order microprocessor with an 8-stage integer pipeline. You can think of this core as a very high clocked, very advanced 486. And extremely low power. Under typical load, the CPU core should consume around 100mW. By comparison, the CPU in your laptop can require anywhere from 10 – 35W. Idle power is even lower. Paired with this CPU is a PowerVR MBX-Lite GPU core. This GPU, like the CPU, is built on a 90nm process and is quite simple. The GPU does support hardware transform and lighting but it’s fully fixed function, think of it as a DirectX 6/7 class GPU (Riva TNT2/GeForce 256). Moving on to the good stuffs..
Sources indicates that the iPhone 3GS uses (again) a Samsung SoC but this time instead of the ARM11 + MBX-Lite combo it’s got a Cortex A8 and PowerVR SGX. If the ARM11 is like a modern day 486 with a very high clock speed, the Cortex A8 is like a modern day Pentium. The A8 lengthens the integer pipeline to 13 stages, enabling its 600MHz clock speed (what I’m hearing the 3GS runs at). The Cortex A8 also widens the processor; the chip is now a two-issue in-order core, capable of fetching, decoding and executing two RISC instructions in parallel. Now that we’re familiar with the 3GS’ CPU, it’s time to talk about the GPU: the PowerVR SGX. Also built on a 65nm process the PowerVR SGX is a fully programmable core, much like our desktop DX8/DX9 GPUs. While the MBX only supported OpenGL ES 1.0, you get 2.0 support from the SGX. The architecture also looks much more like a modern GPU. The SGX ranges from the PowerVR SGX 520 which only has one USSE pipe to the high end SGX 543MP16 which has 64 USSE2 pipes (4 USSE2 pipes per core x 16 cores). The iPhone 3GS, I believe, uses the 520 – the lowest end of the new product offering. In its lowest end configuration with only one USSE pipe running at 200MHz, the SGX can push through 7M triangles per second and render 250M pixels per second. That’s 7x the geometry throughput of the iPhone 3G and 2.5x the fill rate. Even if the SGX ran at half that speed, we’d still be at 3.5x the geometry performance of the iPhone 3G and a 25% increase in fill rate. Given the 65nm manufacturing process, I’d expect higher clock speeds than what was possible on the MBX-Lite. Also note that these fill rates take into account the efficiency of the SGX’s tile based rendering engine. The iPhone 3G S is available in capacities of 16GB and 32GB – both will be available in black and white. The phone also features a new 3MP camera (now capable of recording 30 fps video) on the back of the device. The iPhone 3G S also has the ability to edit videos directly on the device. In addition, the new iPhone 3G S promises better battery life (see image to the right) despite the increased processing power. Speaking of processing power, Apple brags about 2x to 3.6x speed performance improvements over a wide range of apps. Voice dialing is also coming to the iPhone 3G S – something that most other phones have already had for years. However, the voice commands also extend to other aspects of the iPhone 3GS like “previous track”, “play album” or “play songs by The Killers” within the Music app. Other new hardware features include a built-in digital compass, Nike+ support, and hardware encryption. As you may have already surmised, the iPhone 3G S is sporting OS 3.0 which was announced way back in March. iPhone OS 3.0 brings a wealth of new features including long-requested support for copy and paste, MMS, turn-by-turn directions, voice memo recording, Spotlight search, landscape email/notes/messaging, 3G tethering (via Bluetooth or USB), stereo Bluetooth (A2DP), peer-to-peer Bluetooth connectivity, and more. IPhone OS 3.0 will be available to download on June 17 (free for iPhone users, US$9.95 for iPod touch users). As expected, pricing for the new 16GB and 32GB iPhone 3G S will mirror the prices of the current 8GB and 16GB iPhone 3Gs: US$199 and US$299 respectively. To make things even more interesting, Apple is also discounting the price of the iPhone 3G (8GB model) to US$99 to further expand its user base — the new price is effective today. The iPhone 3G S will be available June 17 in the US. So far, Singtel has not announced availability of the iPhone 3G S. I’m thinking it would take at least a couple of months before it hits our shores. Look out for special promos on the current iPhone 3G. I’m thinking Singtel would want to clear their exisiting stock before the new model arrives. As for Maxis, i’ve pretty much written them off as a viable candidate for anyone to get an iPhone. Their offerings are just not compelling at all. Combine the power of the the new hardware with the highly optimized software stack of the iPhone and you’ve got the recipe of an extremely fast iPhone. While I’ve yet to play with one, on paper, the 3GS should be every bit as fast as the videos make it seem. The iPhone 3GS’ performance upgrades should make the phone feel a lot faster, but the real improvement will be what it enables application and game developers to do. Apple recently hired two former AMD/ATI CTOs, presumably to work on some very graphics-centric projects. The iPhone 3GS may be a mild upgrade from a consumer perspective, but what it’s going to enable is far from it; watch out Nintendo. Remember the performance gains we saw in the early days of 3D graphics on the PC? We’re about to go through all of that once more in the mobile space. Awesome.